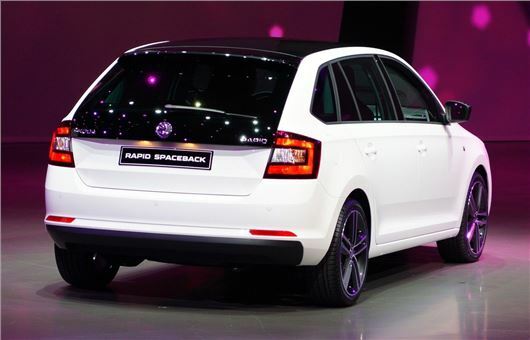 Skoda has revealed the Rapid Spaceback at the Frankfurt Motor Show. Essentially an estate version of the Rapid, the Spaceback is expected to cost around £12,000 and will be available in the UK from December 2013. Skoda is pitching the Spaceback at younger buyers and so is offering a selection of stylish extras, including a panoramic roof which blends into extended tailgate glass, giving the car a distinctive edge. Another neat feature is a double cargo floor, which can split the boot into two horizontal levels – a bit like shelves. Engines are much the same as the regular Rapid – there are four petrol engines - from a 75PS 1.2-litre to a 122PS 1.4-litre - plus a 105PS 1.6-litre diesel and a new 99g/km Greenline diesel with 90PS, which was previously unavailable in the Rapid range and will offer the best economy and lowest emissions.